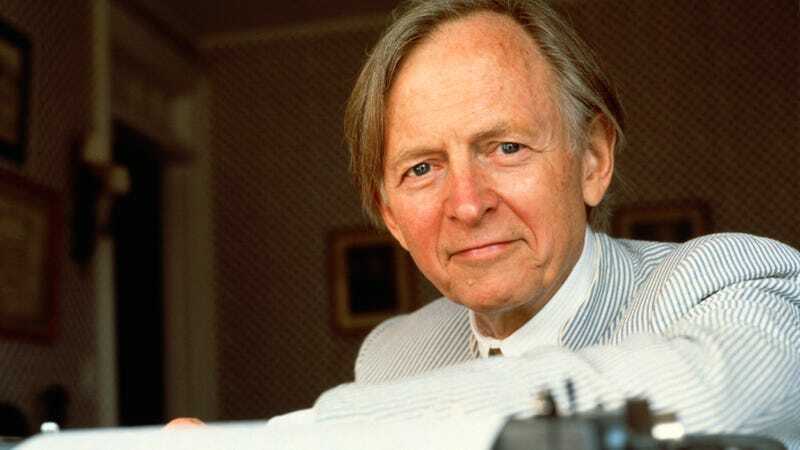 Tom Wolfe, a chronicler of the ‘60s counterculture who helped change the face of nonfiction writing as a leader in the New Journalism movement before turning to writing novels with the bestselling The Bonfire Of The Vanities, has died. As astute observer of social trends in his prime, Wolfe is credited with introducing the phrases “Radical Chic” and the “‘Me’ Decade” to the American lexicon. His agent confirmed the news to The New York Times, saying Wolfe died yesterday in a Manhattan hospital. He was 87. Born in Richmond, Virginia—a city whose Southern manners influenced his distinctive, dandyish style of dress—Wolfe began his career as a newspaper reporter at the Washington Post and the New York Herald Tribune. There, he developed the distinctive writing style full of literary technique and punchy, colorful prose that he would later dub “New Journalism.” His first book of essays, The Kandy-Kolored Tangerine-Flake Streamline Baby, was published in 1965, followed by his book-length chronicle of his experiences traveling the country with acid guru Ken Kesey and his “Merry Pranksters” in a psychedelic school bus, The Electric Kool-Aid Acid Test (1968). Several books of articles, criticism, and essays on the growing counterculture movement followed. After the publication of his hit nonfiction book The Right Stuff in 1979—this one on the far more clean-cut world of NASA astronauts and test pilots—Wolfe decided to concentrate on writing his first novel, using the concept of “New York High and Low” as a starting point. The result, The Bonfire Of The Vanities, was published in 1987, two years after it was first serialized in Rolling Stone, The book was a best-seller and a critical favorite, and was made into a much-maligned film by director Brian De Palma in 1990. Wolfe struggled to follow up the success of his first novel, and it took him 11 years to write his second, A Man In Full (1998), which sparked an intense rivalry between Wolfe and fellow literary celebrities John Updike, John Irving, and Norman Mailer. Wolfe’s third novel, I Am Charlotte Simmons (2004), was received with indifference, and Wolfe was never really able replicate the success of his earlier work. He kept on writing, though, and in 2013 the New York Public Library announced that it had acquired Wolfe’s papers for a sum of $2.5 million. He published his last book, a controversial critique of Darwin and Chomsky called The Kingdom Of Speech, in 2016. His last essay for New York magazine, an obituary for photographer Marie Cosindas, ran in the magazine last summer.